Yonezawa Hamari Chemicals, Ltd. | Hamari Chemicals, Ltd.
Yonezawa Hamari develops manufacture methods and manufacture bulk active pharmaceutical ingredient, pharmaceutical intermediate, food additive, cosmetics ingredients, active organic substances. Yonezawa Hamari maintains ISO 14001 certification since February 2001, and is committed to Environmental-Friendly Chemistry to develop technologies that do not become burdens on the environment by studying effective resource utilization to limit the use of environmental resources. Yonezawa Hamari is committed to serve the health and well-being of the individuals, society and the Earth. Our aim is to garner trust in our company. 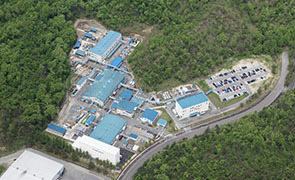 Yonezawa Hamari Chemicals, Ltd. is a 100% fully-owned subsidiary of Hamari Chemicals, Ltd.